Last weekend I finally tackled something that I have long wanted to try -- making my own gyro meat. Of course I had to grill it, and I am very pleased with the results. You can't have a great gyro without a great tzatziki sauce, so I tackled that as well. I tried as best I could to keep this recipe as traditional as possible. The only exception is my non-traditional final assembly. Important: Make sure that your dried herbs are fresh. They only last about six months, so if they're old get some new. Peel the cucumber, slice it in half lengthwise, then use a spoon to scrape out the seeds. This will help keep the sauce from being too watery. Mince the cucumber, put it on some plastic wrap, and sprinkle with a bit of the salt. Wrap the cucumber up in the plastic wrap and let sit for about 30 minutes. The salt will help draw some moisture out of the cucumber. In the mean time, add all of the remaining sauce ingredients in a medium mixing bowl and whisk to combine. Cover and refrigerate. When the cucumber has rested for 30 minutes, open one end of the plastic wrap and squeeze out as much water as you can. Add the cucumber to the sauce, stir to combine, cover and refrigerate. Combine the beef, lamb, granulated onion, oregano, granulated garlic, sea salt, marjoram, thyme, and black pepper in a large mixing bowl. Roll up your sleeves and get those freshly-washed hands in that meat! There's simply no dainty way do do this. Mix it evenly so that all of the ingredients are well incorporated. Squishing between your fingers works well. 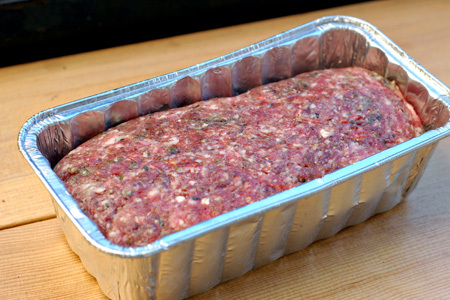 Form the meat into a loaf and put it in a disposable foil loaf pan. Cover the pan with plastic wrap and refrigerate for at least two hours. Start your grill and prepare for indirect cooking over a medium fire (325-350º). Grill the loaf indirect for one hour. Remove the loaf from the pan and continue grilling indirect for another 45 minutes or until it reaches an internal temperature of 160º. 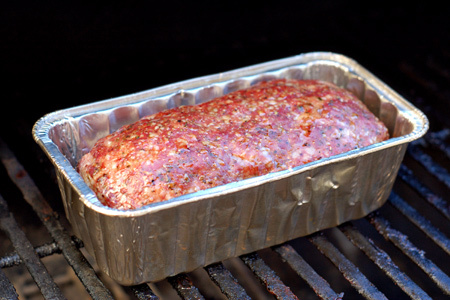 Remove the loaf from the grill, tent with foil and let cool for about half an hour. Once the loaf has rested, slice it thin. Add more coals to your grill, if needed (still indirect at about 325º), and cover your grill grate with foil. 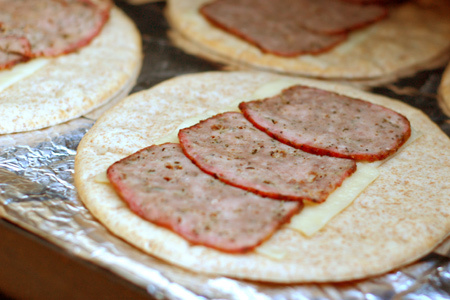 Put two slices of Swiss cheese and slices of the loaf on each piece of pita bread. 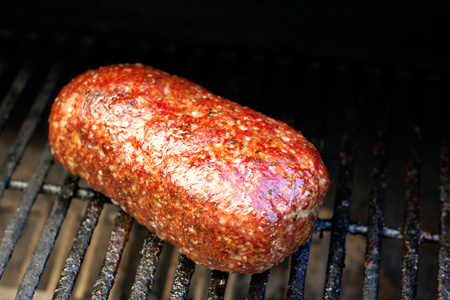 Put the bread on the grill and cook indirect until the cheese is melted. Dress each sandwich as desired with lettuce, tomato, tzatziki sauce, and red onion. Wow, that looks incredible! 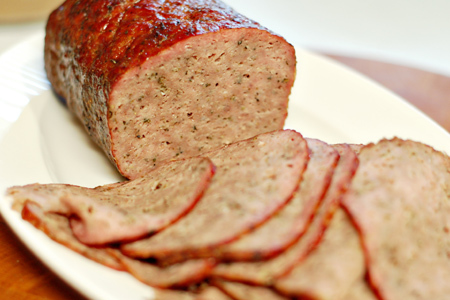 How did you get it sliced so thin and perfect? Basting - I just use my wonderful Kiwi knives and a steady hand. I've been admiring your recipes via Tasty Kitchen for a while now . . . glad I finally made it over to your blog. I absolutely must try this. Thanks, Jenna. Let me know what you think. Really nice job and great photos as always, John. These are one of my favorite Greek foods. I've made gyros twice and loved them both. Did one loaf pan style like yours and one like a fatty. I've been tempted to try Alton Brown's method with a rotisserie. That looks delicious! 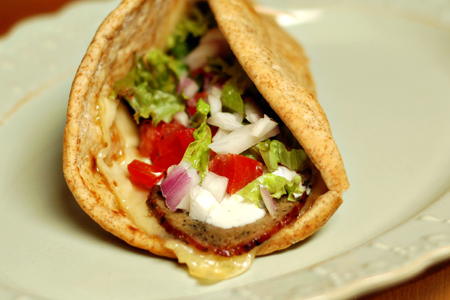 I have been wanting to find a gyro recipe to do at home and I will be trying these. I plan on trying this later on in the week... but since it makes so much meat, after the meat has been cooked, have you had any luck freezing it? oh my! I LOVE gyros, looks soooooooooo good! John, I cooked this up to your specs and it was fantastic. Wonderful Tzatziki sauce recipe too. The cumin really added a nice dimension to to the flavor. Thanks for all the great recipes and the great website. You're certainly welcome, Chris. I'm glad you enjoyed it. I dig happy eaters. Looks great. I will make it. Gyros Gyros Gyros love em ever since my days in the middle east. Yours look just as good. Ooooh my this looks delicious! Definitely want to try it! I've baked gyro meat before but put a brick on i to "squish" it into a dense loaf. Turns out great. This recipe was amazing - I made it for a party and it was a huge hit. Thanks! I made these as meatballs on the Performer the other day, then served them in pitas. The flavor on the meat was fantastic, and the Tzatziki was spot on. Fantastic! Mike - What a great idea! I think I'll have to steal that and come up with a Mediterranean meatball sandwich. I'm really glad that you like the recipe. I love this recipe. Thanks so much. I spent 1 year stationed in Chania, Crete Greece and ate many gyros while there. I would recommend adding french fries to this, as this is how they were served over there. They really add something to it! Travis - Thanks for the kind comment. Adding fries sounds awesome! Valerie - Cook it to an internal temperature of 160*. I just added that to the recipe. Thanks for the question. Please do stop by and share your thoughts after you try it. Following up --- we loved it! And the leftovers froze well, too. This is a neat technique and the flavor was spot on for our tastes. Thanks for the groundwork!